Syrah and Shiraz are the same grape, but the two names generally denote different styles of wine. Syrah: Most common in the South of France where some very tasty (and expensive) wines are produced in the Northern Rhone. Great examples can also be found on the west coast of the US. A full bodied wine with meaty flavors and spicy pepper notes along with raspberry and blueberry fruit. 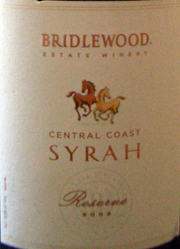 Shiraz: Australian (where the style was made popular) and other New World regions' name for Syrah. This term is generally used when the resulting style of wine is a rich, robust, juicy and jammy wine with high alcohol. While stylistically different, all Syrah is big bodied with lots of flavor, spice and quite a bit of tannin. They both go with big juicy meats: beef, shortribs, lamb. As long as the food is flavorful and not too acidic, Syrah will work well. ...and here if you're in more of a Shiraz frame of mind.